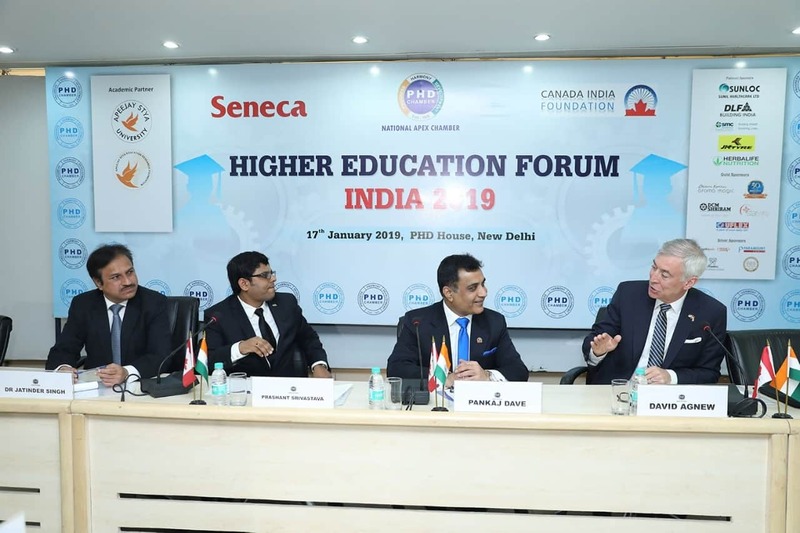 Seneca President David Agnew (far right) participating as a panelist at the Higher Education Forum in New Delhi. TORONTO’S Seneca College President David Agnew renewed Seneca’s memorandum of understanding with the National Institute of Financial Management (NIFM), a leader in training Indian civil servants, during his recent visit to India. Agnew also signed a new agreement with Pandit Deendayal Petroleum University during the International Universities Conclave 2019, which occurred as part of the Vibrant Gujarat Global Summit 2019. This partnership will provide Seneca employees with invaluable international experiences. Seneca renewed its MOU for the next five years with the National Institute of Financial Management (NIFM) Faridabad, last month. NIFM is a leader in training Indian civil servants in financial management and good governance. Since June 2016, NIFM has sent more than 200 Government of India’s officers for short term training programs at Seneca on contemporary areas of financial management as part of their partnership. NIFM was set up in 1993 as an autonomous body under the Department of Expenditure, Ministry of Finance, Government of India. The Union Finance Minister is the President of NIFM Society. The mandate of NIFM includes providing training and professional education in financial and fiscal management for officers of central accounts and finance services, Central and State governments, officers of the defence forces and to various parastatals. Pandit Deendayal Petroleum University’s 100-acre campus is located in Gandhinagar, which is the capital city of Gujarat and located 23 km north from a well-developed city called Ahmedabad with a population of 8 million people. The city is famous for its remarkable cultural development and social life. PDPU offers multiple courses ranging from engineering, arts, and management along with maximum exposure and opportunities to its students through various national and international exchange programs with some of the top universities worldwide. For the development of its faculties and staff the university endeavors for various joint exchange and research programs. In 2013, Seneca entered into this agreement to facilitate the opportunity for PDPU students enrolled in the university’s BBA program to study in Seneca’s Liberal Arts program. The renewed MOU signed during the International Universities Conclave aims to provide international experience to faculty and staff of both institutions. The MOU was signed by Dr. C. Gopalkrishnan, Director General of PDPU, and Agnew.